L0282 2x 9 Gray Car DVD Player HD Monitor Touch Screen Headrest S Zipper Cover. Features Overview : - Sense of Touch design Note : Installation is not available if the airbag or electric seat has been installed. Built-in Speakers - Built-in 32 bit games - Built-in IR transmitter - Built-in FM transmitter - Built-in headset jack - FM Transmitter Frequency : 87.7/88.1/88.5/88.9/106.7/107.1/107.5/107.9MHz - The distance of the shaft (big size bracket) : 80138mm - The distance of the shaft (small size bracket) : 80196mm - The distance between DVD player and the bracket : 5891mm - Aspect ratio : 4:3PS/4:3LB/16:9 - Rotation Screen : Horizontal, Vertical screen can be switched - Languages: English / Simplified Chinese / German /ish / French / Portuguese / Italian / Russian - Infrared Remote Control - Operating Voltage : DC10-16V - Maximum operating current : 1A - Gross weight : 1.85kg (included IR headset x1) - Actual weight : 1kg - Product size : 270 x 177 x 36mm - Package size : 305 x 215 x 125mm. Screen - Size : 10.1 inches digital screen - Resolution : 1024 x RGB x 600. Screen brightness / contrast / hue / saturation adjustment. 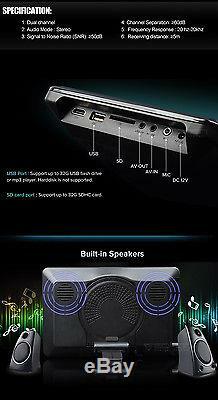 USB/micro SD - Built-in USB/SD port - USB Port : Support up to 32G USB flash drive or MP3 player, harddisk is not supported. SD card port : Support up to 32G SDHC card. Input/Output: - RCA Audio R / L input / Video input 2 - RCA Audio R / L output / video output / audio output - 3.5 Headphone jack 1 - DC12V Interface 2. E0780 infrared stereo headset Description of Functions : 1. Car IR stereo headset (2 channels) 2. Comfortable wearing of ergonomic design 3. Compatible with most of car audio and video products. Frequency: Channel A: L / 2.3MH R / 2.8MHz Channel B: L / 3.2MHz, R / 3.8MHz 3. Signal to Noise Ratio (SNR):? Power supply: two AAA batteries (not include battery). English manual x2 - Multifunction remote control x2(battery excluded) - Cigarette Lighter Receptacle power cord x2 - Power AV cable x2 - Extension cord x2 - 32 bit game disc x2 - Bracket x4 - 10mm / 12mm / 12.5mm / 14mm / 15mm plastic tubes 5 pairs - Screw x2 - IR Headset x2. We will choose the lowest price for your cities. Above is the policy of Courier Company, hope we could get your understanding and attention. However, we are not responsible for installing or uninstalling. Damage or missing components Our products are all brand new and inspected carefully before sending out. Please check the package before the courier leaves. Install and operate products inappropriately. Product is opened or repaired by unauthorized person. Buyers as importer are responsible for paying such costs. Certified technicians test all the items before sending to you. 4Core Android 5.1 Touch Car 2DIN Stereo Radio 7u DVD GPS CAN-bus for AUDI A3 S3. Android 4.4 8 Car Stereo DVD Player GPS for Mazda 6 WiFi 2009 2010 2011 2012 U. Quad-Core Android 4.4 OS Special for. ISO Quad-Core Android 4.4 Unit. GPS WiFi Bluetooth IPOD 2 DIN Android Quad Core in dash Car Stereo Radio Player. Kitkat Android 4.4 1Din 7 UA Car DVD Player Stereo GPS Navigation FM Radio WiFi. Flash UI Eonon 6.95 2 DIN Car DVD Player Radio Stereo Bluetooth Touch Screen U. 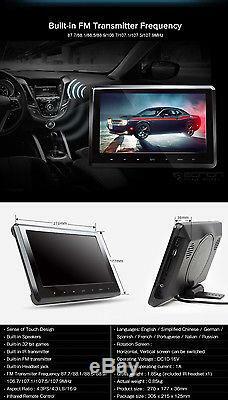 7u Touch Screen Head Unit Monitor 1 DIN Car DVD Player Bluetooth Detachable USB. Flip Down Monitor with DVD Player. Beige 10.1 Car Flip Down Digital Monitor Overhead DVD Player Game USB SD U HDMI. Universal Headrest with DVD Player. Dash Cam, Car Drive Recorder. New LCD 720P DV Car Camera DVR Camcorder Video Recorder Night Vision PIP U CAM. R0006 U HD 720P 2.4 LCD Car Camcorder DVR Dashcam Video Recorder Night Vision. 1DIN Holder for Handy & Tablet. 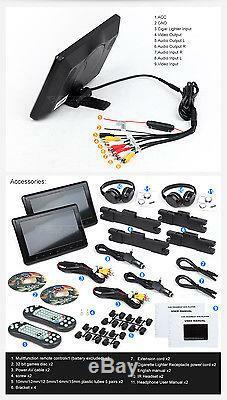 Car 10 Digital On Dash Standalone Headset Monitor Screen VGA Port/Touch Button. 4.3 Car drive recorder Sensor Back Rear View Parking Mirror Monitor Free Camera. Camera for Eonon Android Unit(DVR). USB Type Backup Rear View CMOS Camera for EONON Android Unit with DVR function U. Car Color CMD Waterproof Parking Reverse Camera High Definition Reversing Black. 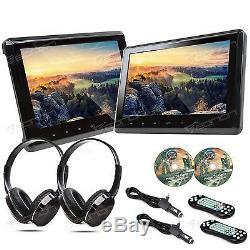 The item "Portable Pair 10.1 Black Car Headrest CD DVD Player Game 2x Wireless Headset U" is in sale since Friday, April 29, 2016. This item is in the category "Consumer Electronics\Vehicle Electronics & GPS\Car Video\Car Monitors w/Built-in Player". The seller is "ukcarhifishop" and is located in Hong Kong. This item can be shipped worldwide.